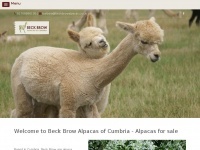 Beck Brow Alpacas are prize winning alpaca breeders. Based in Cumbria, we have alpacas for sale including pregnant females, stud males and pet boys for sale. Husbandary courses and hands-on days held on farm.